Bellvue is about the last place you might look for the North American headquarters of a growing international corporation. But that’s exactly where you’ll find Noosa Yoghurt, an Australian company that is taking the gourmet yogurt market by storm. The company’s strawberry rhubarb flavor took gold and the peach took bronze in the open flavor competition at the annual World Dairy Expo Championship in Madison, Wis. in October. Noosa is also one of the best-selling items in the Fort Collins Whole Foods Market, selling 80 cases per day. Noosa is also available in grocery stores and coffee shops throughout Colorado and in selected markets from Philadelphia to Seattle. All the production is done at Morning Fresh Dairy in Bellvue. Owners Rob and Lori Graves added 10,000 square feet of space for the yogurt-making equipment. 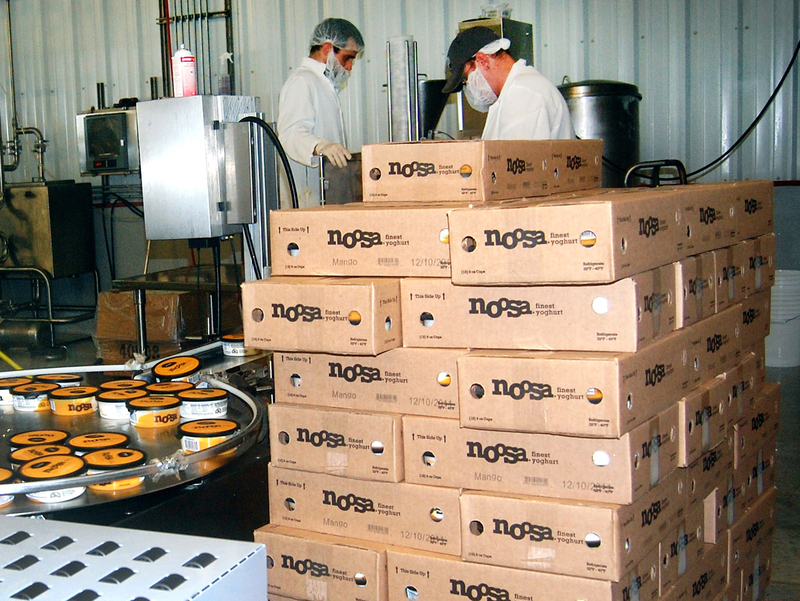 Noosa production line at Morning Fresh Dairy in Bellvue. All the milk used to make Noosa Yoghurt comes from the Morning Fresh herd of about 600 cows. The milk travels about 100 yards from the milking parlor through the pasteurizer to the three tanks where the yogurt is cultured in batches of 5,000 pounds or 450 gallons at a time. Each batch takes 13 hours to make, and even running the operation around the clock, the weekly output is limited to about 70 to 80 tons, according to Mathewson. That’s about to change in the new year, however. Three more culturing tanks have been added, a new, faster filling machine has been installed in the remodeled clean room, and Mathewson expects output to double. Once the additional production ramps up, the company will be hiring workers to keep up with the demand. The company now employs 20 in all phases of the operation and plans to add 10 more, mostly in packaging and production. Not bad, considering Noosa started operations at Morning Fresh just about two years ago. At the urging of Koel Thomae, an Aussie friend living in Boulder who is now part-owner of Noosa with the Mathewson and Graves families, Paul’s brother Grant set up the local partnership in 2008. The first cups of yogurt rolled out to local markets and on Morning Fresh home delivery trucks in January 2010. That doesn’t mean the Mathewsons are new at the yogurt game. Under the name Queensland Yoghurt Co., the brothers have been using their grandmother’s recipes to make cultured-milk products on Australia’s Sunshine Coast since 2006. They have partnered with local dairies in New Zealand — where it is known as Piako — and in the UK, as Little Melton. Noosa is the name of the town near Brisbane where the Mathewsons grew up. The secret to the success of Noosa is its texture, or as foodies say, mouth feel. It is in the same category as the thick Greek yogurts such as Fage, with noticeably more creaminess than other brands. Part of the secret to achieving the distinctive Noosa texture and flavor, according to Mathewson, is the addition of local honey to every batch, even the fruit-flavored varieties. It takes 55 gallons of honey from Beeyond the Hive in Fort Collins to produce a week’s worth of Noosa. Noosa’s retail price is about the same as high-end Greek-style yogurts, above 20 cents per ounce. In true Australian fashion, however, Noosa comes in larger packages, an 8-ounce and a 16-ounce version, in six different flavors, which vary seasonally. Mathewson said the most popular flavor in other parts of the world, passion fruit, isn’t available in the U.S. because the company only uses the whole fruit, which is difficult to import. Other popular flavors in Australia include coffee walnut and lemon myrtle macadamia. Mathewson said part of the local expansion plan is to add a new flavor each year, and to increase shelf life from 30 days to 45 days to accommodate national distribution. 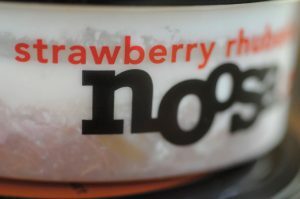 Noosa uses only whole milk from Morning Fresh, although the company does make a 2-percent version in Australia. Because the texture is so important, the company is proceeding slowly to find the right balance. That’s about the only part of the operation going slowly. Plans are afoot to move Noosa to a new building across County Road 54E from the dairy – Mathewson and assistant general manager Dustin Braeger work out of a trailer right now – and offer public tours and tastings. And among the positions to be filled next year will be Mathewson’s. He and his young family are headed back to the Sunshine Coast in June.